EXIT 463 AT I35 E AND GO NORTH ON THE SERVICE ROAD TO SAN JACINTO BLVD. RIGHT ON SAN JACINTO TO COLORADO BLVD. OFFICE IS LOCATED AT INTERSECTION OF SAN JACINTO AND COLORADO BLVD. WE CAN HANDLE YOUR NEEDS ONLINE OR BY PHONE, BUT IF YOU NEED TO VISIT OUR OFFICE, THE BEST TIME TO DO SO IS TUESDAY OR FRIDAY. The Denton Social Security office is located in Denton 76205. The following page includes information for this location like the office phone number, hours of operation and driving directions. If you have any interests or comments about your retirement benefits or are interested in making an appointment, call the following Denton Social Security office. The Denton Social Security office is located at 2201 Colorado Blvd. The Denton office shares information, help and services directed by the Social Security Administration. The following page features information for this location like the office phone number, hours of operation and driving directions. 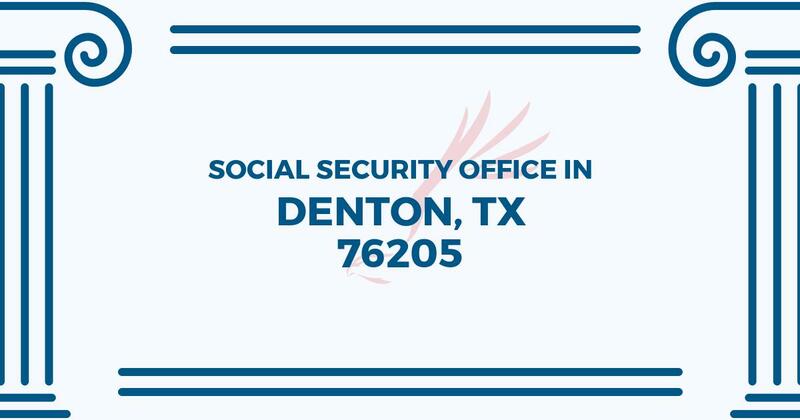 If you have questions or concerns about your retirement Social Security benefits, or you need to schedule an appointment, contact the Denton Social Security office.